This plant grows to 6 feet tall. 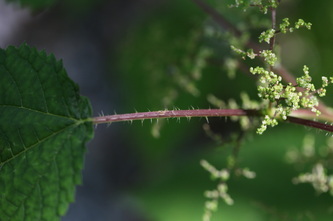 The plant has opposite leaves and stinging hairs. 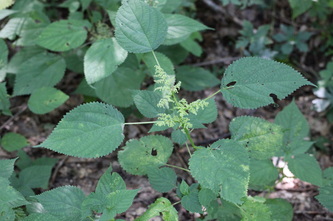 The leaves are 2 to 4 inches long, ovate, with heart-shaped bases, and are coarsely toothed. This species is often colonial. This plant is poisonous if ingested. The cure for the sting of the Stinging Nettle is to crush and rub the stems and leaves of the Jewelweed plant (Impatiens capensis or Impatiens pallida) which often grow nearby. This plant flowers from May to June. It is found in waste places and roadsides.